It’s sometimes weird how things can seemingly vanish into thin air. I once offered someone my last stick of gum. I dropped it and it vanished. We looked all over but had to give up because I was leaving for the airport. Hours later while on the plane I leaned forward to get something out from under the seat in front of me and there was the gum. Sticking straight up out of the cuff of my jeans. Also, for a new way to help support the site you can head on over to the donation page and get some wallpaper images in return! Thanks! A couple of weeks ago, one of my Fimo clay figures fell on the floor all by itself, and one of its horns broke in half. It took over an hour of crawling on the floor to find it, and when mom found it for me, it was in a place that seemed impossible (there were things “blocking” this area). Oh, and the horn was the same grey color as the floor! It was SO much fun trying to find it! I did that with my keys once. Though at the time I though I had dropped them down the elevator shaft. My sister-in-law never had to worry about lost jigsaw pieces. I one were missing, all she’d have to do was check her cat’s hiding places. Always worked. We lost one of my brother for like, three months. We finally found him behind the couch when we were looking for the TV remote. Turns out he had it. ..Hm. I feel like I should know what game this is referencing, but I can’t seem to remember. Hints, anyone? I have no idea either! 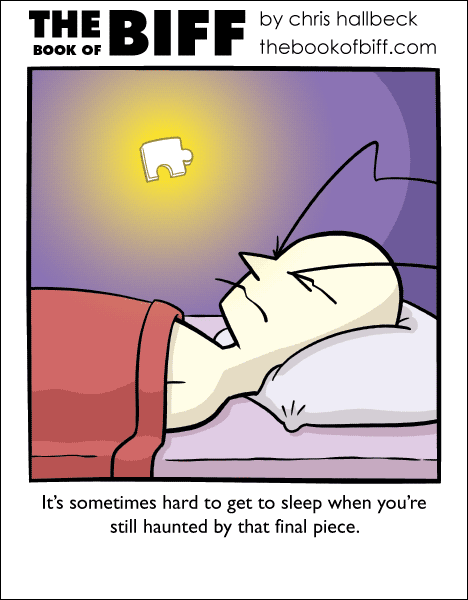 I thought it was about puzzles. Heh…that’s funny. Considering the hedgehog comic, I figured you were referencing Jiggies from the Banjo Kazooie series. Now you are just making up words! This is why I always close the lid on the toilet seat. If the seat is up, anything I drop seems to find its way in the toilet. I don’t have to be near the toilet, the bathroom, or even in the same state. When I drop anything I check the toilet first.